Today marks the 10 year Birthday for Kingdom Hearts 2 released in North America. I'll never forget it, picked up the game with the Collector's Edition Guide book. And it was the beginning of Spring Break for me. Happy double birthday then, I suppose. HAPPY BIRTHDAY, MY FAVORITE GAME OF ALL TIME! i remember this day. my dad drove me down to buy it but we caught a flat tire so i sat in the walmart garage with the box in my hand falling in love with every detail. then we headed home and i popped it into the PS2 immediately, the sun was setting so coincidentally it was twilight. i found every aspect of the game completely awesome and it was totally perfect in my eyes. shout out to KH2 for it's surprisingly deep combat system in this game. Well, it's been ten years, Seifer. Apparently MSN has taken notice of the ten year anniversary as well. I didn't get KH2 when it first came out, but I remember getting it at the beginning of summer vacation and played for 2.5 straight months. Now I'm working and my time of summer vacations are over.. Ten years ago, this was the most important day of some of y'all's lives. But for me... pfft, I was a kid who didn't even play video games back then! Still, even though I had no idea that this was happening, KHII was big enough that the manga was being sold at my school's book fair that year. Yep, that was my first glimpse at the franchise... Shiro Amano artwork of a spiky-haired kid with Chip and Dale sitting on his head. you aren't much younger than us (me especially), but unfortunately you don't completely feel what we do for this game and franchise. Maybe not, but hey, what can I do about it? I didn't grow up with it, but it's still become one of my favorite franchises of all time. Good enough for me! ​plus I haven't had 14 years of exposure to whittle down my patience and turn me all exasperated with the franchise as of now. Man alive to remember waiting for this game, and playing it with my buddy Holden, and my ex friend all those years ago. Man the game was crazy, and crazy fun. I still need to get it for PS3. 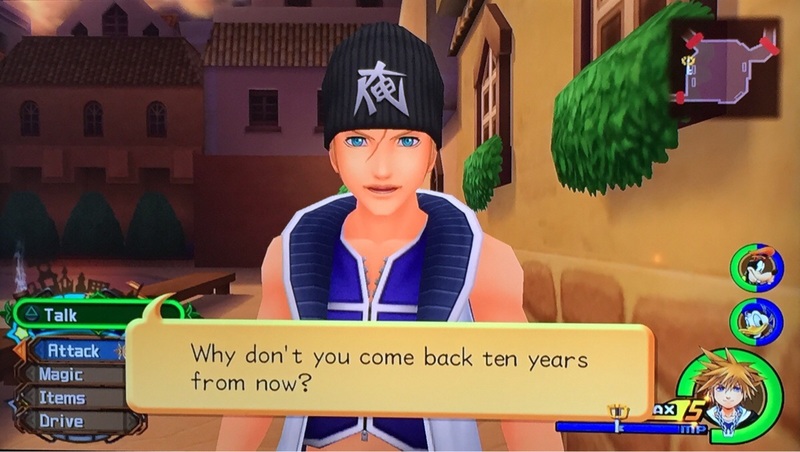 I didn't play the KH series until 2008, two years after the KH2 release. I first got a copy of KH2 from a sisters friend who wasn't into it. Played for a very short time, was confused as hell, and bought the first game soon after to find out more about it. Hooked ever since. 1 true mistake I made was not knowing of CoM existence until after I played KH2, so the game left me frustrated and confused as to why Sora didn't care that he woke up in a giant egg under a mansion a year later after KH1 and never bothered to find out why. Luckily Re:CoM was released days after I finished KH2. Wow 10 years, I remember watching my sister playing it when we were still young. This was my first KH game I've played. I remember back in 2009 my little brother was very sad I decided to play KH2 to cheer him up and that's how I began to love the series. I'll never forget that day. its been so long T_T 10 years of greatness! I was late to the party - but after a few years, KH is still just as near and dear to my heart. I'm sure it still will be after ten. There's something so inexplicably good about this series that's drawn me in like few games ever have.